In this post, I will present a very simple USB plug-and-play Raspberry Pi remote control. Recently, I listed the 7 Raspberry Pi accessories to build a XBMC media center in which I listed a USB IR remote. 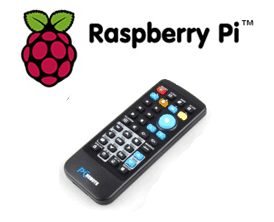 If you are in the market for a Raspberry Pi remote control, you may want to check this page. You may also have stumbled upon the FLIRC USB Dongle. Unfortunately, what those pages do not say clearly is that if you are looking for a simple inexpensive Raspberry Pi remote control for your media center then you do not have to spend $20 or more to get a decent working USB remote. Take a look at the ~$5 Raspberry Pi remote control presented below. There are several Android apps that can control XBMC running on your Raspberry Pi. However, if you are like me and prefer to use an infrared remote then there are quite a few options and the ones listed below are the cheapest Raspberry Pi remote controls you can find today. Whether you run Xbian or OpenELEC or Raspbmc as your operating system, these remote work with no installation or configuration required. You may find these remotes for less than $5 on Amazon. They are available in 2 different versions with essentially the same buttons. One remote is bigger with a regular USB receiver and the other is smaller with a retractable cord. So you may purchase whatever fits your need. They are plug-and-play remotes meaning there is absolutely no configuration or setup required. You just plug the Raspberry Pi remote control into one of the 2 available USB ports on Raspberry Pi Model B Rev 2 and you are ready go. These remotes are recognized as a keyboard/mouse device. Just ensure that “Remote control sends keyboard presses” is enabled under “Input Devices”. Almost all of the basic functions that control XBMC such as play, pause, stop, fast-forward, rewind, skip next, skip previous, volume controls, direction keys, select/enter, and power-off work out-of-the-box. Note that if you running operating systems like Raspbian or Pidora then you may not find these remotes to be very useful. Apart from the cost there are a couple more advantages to using this cheap Raspberry Pi remote control. First is that these remotes are recognized by operating systems as keyboard and mouse. If the situation requires, you can use the mouse directional button or the click buttons to navigate and do certain things. It is almost like a mini keyboard/mouse in hand. Next advantage is the biggest for me. I have a Logitech Harmony 650 remote control and you can not only make your Harmony remote control your Raspberry Pi media center, but you could also customize the remote keys and add more functions like update/clean library, power-off sequences, subtitle download, media info display, and a lot more. Follow the directions provided in this post to create a keyboard.xml file in your xbmc/userdata/keymaps folder. Reboot your Raspberry Pi and you will have even-more remote control ability. So there you go. If you are reading this post then you did your research. You do not have to spend a lot on Raspberry Pi remote control to enjoy your media center.